The day before you make this, brine the chops by mixing 1 cup of kosher salt (note: kosher salt measures differently. If using sea salt or table salt, use only 3/4 cup) in one gallon of cold water, as cold as you an get it. Place the chops in the water and put into a tight container. (I have a large, 2 gallon tupperware-style container I use just for brining). Place in the refrigerator and brine overnight. When done, pour off the water and thoroughly rinse the brine off the chops. Lay the chops out in a baking dish. A 9x14 dish will hold 6 comfortably. Mix the jelly, vinegar and garlic with a whisk. I may have added some onion as well, but I forget. Pour the liquid over the pork chops; they should not be completely submerged, but about 1/2-3/4 will be beneath the liquid. Make sure some of the liquid is on top, though. Cover with foil and put in the oven for an hour. It's perfectly possible to add more flavor to the brine, but be wary of acids; they change the ratio of salt to water, and that ratio is critical. Too much salt and the chops absorb too much and get overly salty. Not enough and there's no osmosis and the brine has no effect. This was purely experimental, I am sure that there are many things that would make excellent flavor components here. In my case, the jelly was homemade so I know that it was an extremely pure jelly, too. Logrus, Inc. offers a plan for those who rely upon Views, the Chaos Tool Suite and/or Panels to be healthy, stable and thriving projects. A commitment to this plan is a pledge of support to ensure that not only do these modules retain consistent, professional maintenance and the attention they need to remain a stable backbone of the Drupal site-building process, but also to expand and gain new features that will add even more power to the already considerable toolset at your disposal. Architectural advice regarding the use of these modules. Advice or coding of custom features for these modules, either for private use or for contribution back to Drupal. Special attention paid to fixing bugs that affect client usage of the modules. Special attention paid to adding features to the modules for client usage. General attention to the issue queue for these modules. The time is "use it or donate it" and cannot be carried over. If the client has no specific needs to address, these hours will be spent in the drupal.org issue queues to answer support requests, review patches, fix bugs and add features. This usage of time will help to ensure that Views, Panels, CTools and other modules will continue to maintain a high quality of support and development for the Client, and for all Drupal users. Advice can be given by phone or email. In-person advice can also be available, though travel costs will be invoiced separately. As time is finite, there are a limited number of contracts available. The minimal package is a month-to-month subscription for $500 per month. It includes 2 hours, and will be invoiced monthly until canceled. This may be invoiced monthly or quarterly. The supporter package is a month-to-month subscription for $1,000 per month. It includes 4 hours and will be invoiced monthly until canceled. This may be invoiced monthly or quarterly. The premium package is a yearly subscription that is priced at $2,000 per month with a one year commitment. It includes 10 hours per month and will be renewed on a yearly basis. That's 20% more hours than the Supporter package! Customized pricing and coverage can be negotiated based upon your needs and Logrus’ availability. You can use the strawberry compote recipe or just make something up. That compote recipe works with most any berry. Many fruits work well here just as fruit, such as bananas. Put fruit in the bottom third of the crepe. Fold this over, roll and roll again so it is rolled to 1/3 of its size, with the fold on the bottom. Lightly butter and sprinkle with cinnamon sugar. Put all folded crepes on a buttered baking sheet, and bake in a 400 degree oven for about 10 minutes. Add whatever dessert toppings you want, but caramel or chocolate sauce are really good choices. For the caramel sauce, we used Trader Joe's fleur de sel caramel sauce. It actually overpowered the strawberries slightly but oh my it was good. With a wire whisk, mix the milk, sugar and flour until very smooth. Then beat in the eggs and add the cooled butter and vanilla. Heat a non-stick surface until water jumps and sizzles when you flick a few drops on it. Take a small ladel and ladel some of the batter, using the ladel to smooth it into a nice circle. Cook less than a minute until the the top is no longer liquid. Then flip and cook no more than 15 seconds on the bottom. 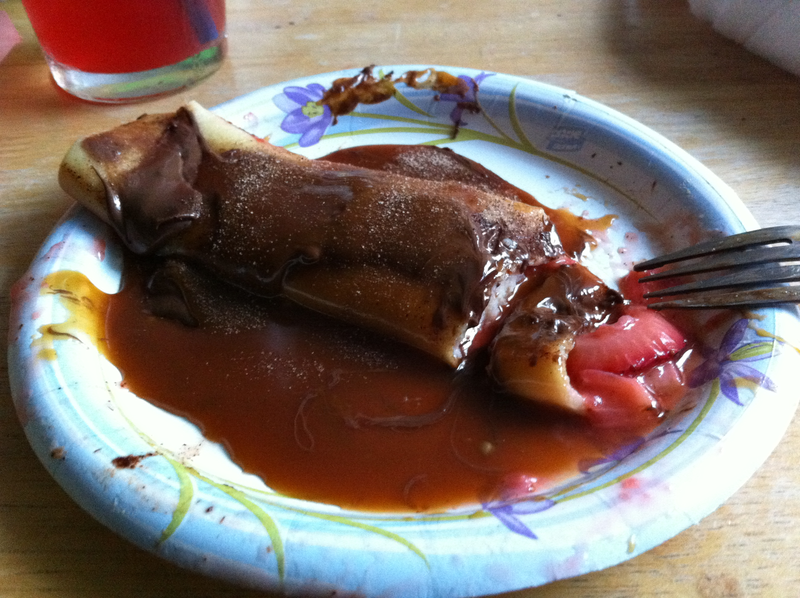 The crepes should brown just a little and should not get crispy at all. If they get too brown or crispy then the heat is too high. If they don't brown at all the heat is too low. Usually the crepes will be set aside and reheated. I do my crepes two at a time on my electric griddle, which is just about the most awesome kitchen utensil I have. In a small sauce pan, heat 1/2 cup water to a simmer. Add the sugar until it dissolves. Simmer and reduce until you have a nice, sticky syrup. Set aside to cool. Separate the strawberries in half. Puree the first half (I just used a masher) and slice the second half. Combine all three ingredients and refrigerate. minutes, but I find that the flavors are best if left to simmer for 3 hours. As near as I can tell you can let this simmer on the lowest heat you can give it all day and it will just get better and better. About the time you're ready to put the water on for the noodles, brown the ground turkey along with the beef stock base and the remaining salt and onion in a saute pan. Chop it into the smallest pieces you can. Drain and add to the sauce. Boil the spaghetti noodles as directed on the package. Serve the noodles with plenty of sauce and some shredded parmesan or romano cheese, and a nice crusty bread with olive oil or butter. For best results, make the sauce the day before you intend to use it and store in the refrigerator overnight. I happen to use the Better than Boullion "low salt" stock. If not using low salt stock you may want to reduce the amount of salt you use. Either way, I find that the sauce is best if you don't skimp on the salt, but it is possible to oversalt it. I make this dish specifically to have a dinner and at least one lunch as leftovers because it's so very good the next day. Plus all the kids I've tried it on absolutely love it, because it's meaty and spaghetti. This one had run as far from me as he could and was waiting for me to make a move. But I will look back, first.